Ever Seen a Blaze Of Glory?? Here is a literal "blaze of glory". 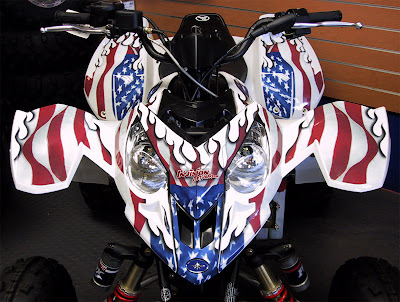 These atv's are decked out in full blazing glory, ready to go blaze a trail and show their american pride. Not bad eh? I have yet to see any dirt bike graphics of this nature, although I'm sure these could be retro fitted. There were some called "stars and stripes"..some of these are kind of overkill depending on your personal style and/or needs, but I couldn't resist at least posting these up. 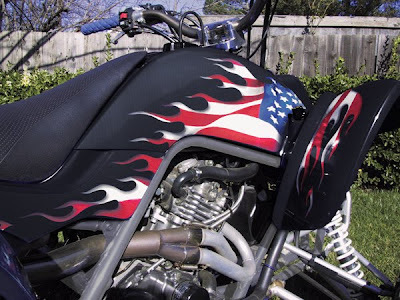 American pride with a bit of attitude for your ride! 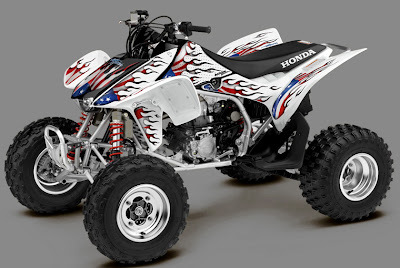 These particular graphics are made by Invision Powersports. I like the small car.So beautiful. wow.. thats pretty much what i can say..love the style ..i always dream about getting one just like this one ..well i love the colors on the american flag..